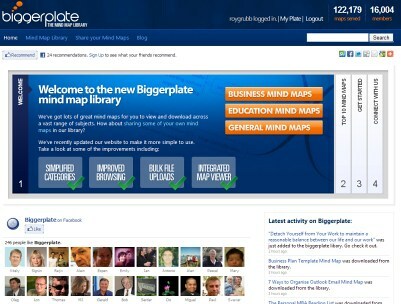 Biggeplate’s mind map library has just been relaunched with a spiffy new look and a heap of new facilities and improvements. For those who don’t know, this is the largest public library of MindManager maps on the web. You can upload your maps there for the world to to see, admire and use, and download others’ maps for your own use (within the stated copyright, case-by-case). browse and search functions are much better, so it’s easier for you to find a wider range of mind maps. So well done, Liam and crew. Take a look round! Thank you Roy for your kind words about our new site, we are really pleased with the results, and (most importantly) so are many of our users it seems! Lots more exciting additions to come over the course of this year, so hopefully we’ll have plenty more to talk about soon!